← Why do we care if others are not like us? You are the example of humor under adversity and I admire that about you. That makes you stronger he he!! Thank you darling! I admire your strength and ability to take a stand in the face of adversity. You don’t know this, most people don’t, but I was raised in a cult, so I understand EXACTLY what type of crap you’re dealing with in your battle. It takes a remarkable amount of fortitude to soldier on under the pressure that must have been applied by your opponents. You’re a helluva woman yourself Louise. I love you! Oh honey, thank you for sharing that with me. The pressure is going to get even more intense because I am getting ready to move forward with this story. My numbers would indicate they are watching and very likely worried.I can’t walk away from this Melanie. As you well know some things you can’t walk away from or if you do it does more harm. You can’t walk away from your fight because “you just can’t” you have a beautiful child and a very cool husband, what a doll. I am very tired of people taking advantage of those who can’t defend themselves. I am a big fan of your my dear girl. You WILL win your battle we need you and you have so much to offer. Thanks for all of the love and support you send my way. It means so very much to me. I read your emails to my hubby and we cried over them together. Keep on with your fight. They’ll push back, but that only means they’re scared of your strength and power! I’m fighting hard and strong, and I’m not ready to give up. Not by a long shot. Many many years ago I read a book by a dr. Norman Cousins who became very very ill, life threatening ill. And he decided (like you) to laugh his way to wellness against all odds. Sat in the hospital watching Tom and Jerry and everything that made him laugh. The hospital thought he had gone mad. He is still alive as far as I know and wrote a book about it. You have the laughter down, that is the best medicine. And you are so beautiful. I’ve heard about him! Thanks doll. 💖 In doing the best I can to laugh through the pain of it all! 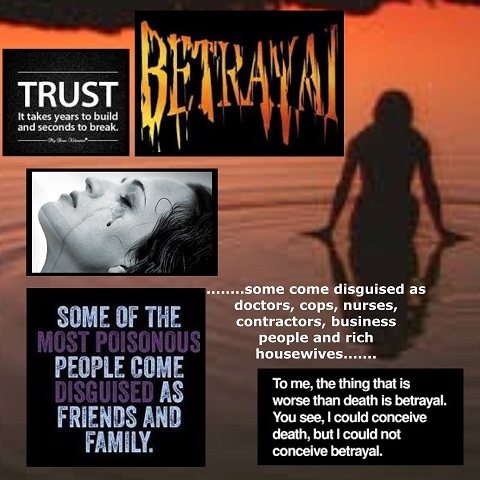 Death hurts while betrayal hurts and destroys. You are on point again. You are such a lovely lady and my heart has been with you to. You have had so much to deal with and I see how brave you are and that helps me.